Spatial processes are the focus of geography and should play a prominent role in geographic information systems (GIS). However, current GIS focus on the static description of properties in space and do not systematically support processes. 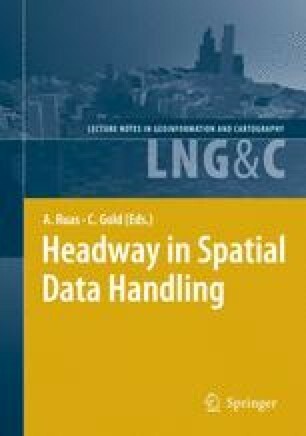 A general method to describe spatial processes is a prerequisite to including processes in GIS software. This paper outlines an attempt to a general and application independent method to describe processes, limited currently to physical spatial processes. The methodology is based on first modeling a process with a deterministic model. The deterministic models employed here divide the region of interest into blocks and define the influence of the process on each block. The resulting model equations are then related to partial differential equations (PDEs), which are an alternative method for describing processes. Thereby, the qualitative characteristics of processes are identified. A method for describing processes has to be capable of covering the identified characteristics of the processes. As an example the process of diffusion of a contaminant in water is analyzed. The results of this study suggest that this approach allows identifying commonalities among spatial physical processes. These insights can lead to a set of types of processes on which a method to describe spatial processes can be based in the long run.